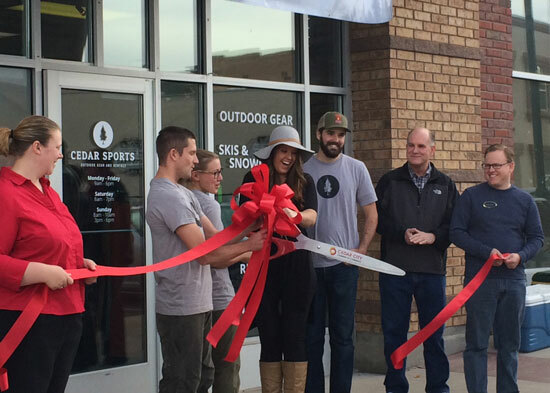 Cedar Sports, Cedar City’s newest outdoor gear and rental shop, is a finalist representing Southern Utah University in the 2017 Utah Entrepreneur Challenge. This is a competition between hundreds of students from all colleges in the state of Utah. Opening last year Cedar Sports is a business venture between four friends: David and Leisel Whitmore and Jaxon and Sarah Haderlie. Though the other three have already graduated from SUU, Jaxon Haderlie is a full-time student working on his masters degrees in accounting and business administration. As a finalist in the Utah Entrepreneur Challenge, Cedar Sports had to create a video highlighting the business. Cedar Sports’ video was made by and features SUU students, recent graduates, and faculty from the outdoor recreation and business programs. Online video voting is open to the public from March 28 at 8 a.m. until April 14 at 5 p.m. The top teams will advance to the final event, where they will meet for the last judging round and a public showcase and awards ceremony on April 15 at Lassonde Studios at the University of Utah. They have already outgrown their current location and plan on moving to the corner of 100 west and Center Street sometime in April. Both their video and their business are examples of what SUU students can accomplish before and after graduation. Cedar Sports promises to provide the highest quality customer service and industry knowledge of any shop of its kind. They consider their customers as family and they intend to provide sincere service to everyone who walks through their door.